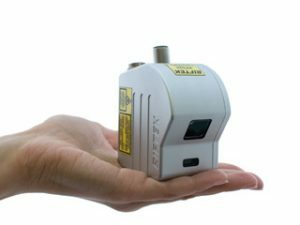 Riftek offers its RF627 Series high speed 2D laser scanners with eight measurement ranges from 10 to 250 mm, a choice of red, blue or IR source versions and linearity to better than 0.05% FS. These 2D laser scanners also come with a comprehensive software development kit and service protocol to facilitate integration into high precision linear measurement tasks that include surface profile, displacement, dimensions, object recognition, flatness, volume, 3D model construction and more. These ARM-based devices deliver selectable sampling rates up to 6800 profiles/sec with fast inputs and outputs for event and multiple scanner synchronization. They employ the optical triangulation principle to provide a base distance and a generous measurement range with a wide field of view. Optional red, blue and IR laser sources allow measurement on reflective materials, high temperature objects, and organic materials. A durable aluminum housing and an innovative high resolution glass lens system provide IP67 protection with shock and vibration resistance suitable for the most demanding tasks. Two compact housing styles cover the scanner geometry requirements for the smaller and the other measurement range models. Volume dimensions for the 250 mm maximum measurement range housing is 44 x 63 x 93 mm (w x d x h). Both have separate power/signal and Ethernet circular connectors rated for IP67. Working temperature is 0 to +40 °С as standard. An integrated heater option is available for -20 to +40 °С. A built-in heater and water/air cooled housing option offers a -30 to +120 °С ambient range. Supply voltage is 9 to 30 VDC. Ethernet connection and a web-browser interface facilitate set-up and programming. An integral reset button and LED status on the housing provide straightforward installation and troubleshooting.